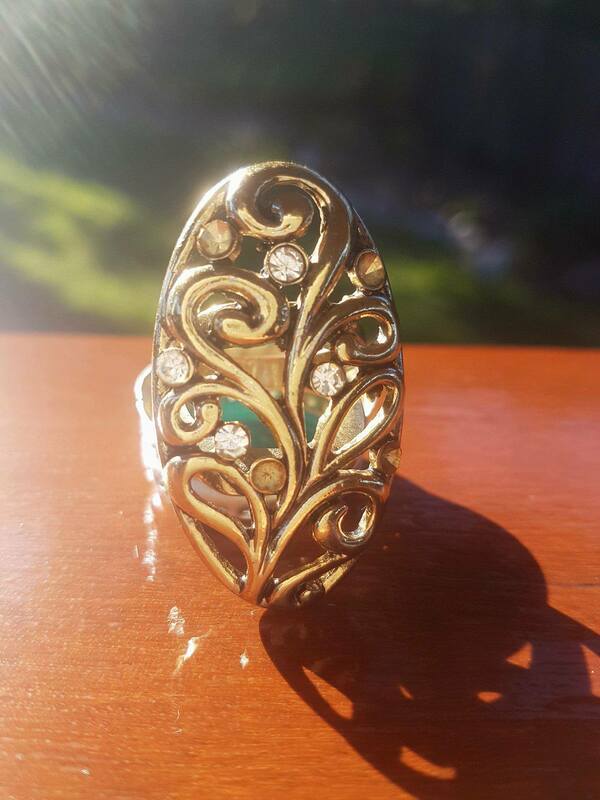 This ring might look like a cheap piece of costume jewellery, but it has a story. It is a story of faith, of courage and of acceptance. Many years ago, I was working with my coach (who is also one of my dearest friends) and at the time I was going through a very confusing time in my life. My relationship with my Mother was not good, I was struggling to believe that I was a good Mother to my children and I was completely disconnected from my purpose. I remember sitting in the park crying my eyes out, everything seemed so hard. I knew intellectually what I needed to do but I kept falling back in to the same habits that has gotten me to where I was at that moment. My coach took her ring off her finger and placed it on mine, she told me that this would be my anchor for staying present. I wore that ring for a very long time. It was uncomfortable, it was chunky, it was too big for my finger and really it was downright ugly! But over time I came to love that ring, it started to ‘fit’ me as I learnt to be present. I also learnt to be kind to myself while I was wearing that ring, to stop judging myself against impossible standards. There came a time when I felt comfortable to take the ring off, I would leave it in my cupboard until I needed to wear it again. Over time the need to wear the ring became less and less, until I felt that I didn’t need to wear it at all. Early last week I saw the ring sitting in my cupboard and I had the need to put it on. It was way too big for my ring finger and was too tight on my middle finger but I felt that I needed to have the ring on. I wore it on Tuesday and Wednesday and then something amazing happened. On Wednesday I flew to the Sunshine Coast to spend time with an Inner Circle that I am a part of (with the same coach who originally gave e the ring). As I sat in the room wearing my ring and listening to others talking, something moved in me. There is a woman in the group (let’s call her Maryanne), she has had a tough life and many things have happened to her. She has days where she feels great and knows how strong she is, and she has other days when she simply feels that she is not enough and she doesn’t know what to do. I have heard Maryanne tell her story and share how she feels many times and this time it felt like I was hearing the same story again. There have been times when Maryanne has compared herself to me and has been left feeling that she isn’t good enough, she has got angry at me for the things she thinks I have achieved in what she thinks is a relatively short time. What Maryanne didn’t want to hear was that I had been her for many years, I had the same doubt, the same frustration, the same anger. We both had different life circumstances, but we had similar stories that we told ourselves about ourselves and our lives. As I sat there once again hearing Maryanne’s deep pain in her words. I wanted so much to help her but I also knew that no one could take her journey away from her, this was her path to tread. Then I remembered the day that I sat in the park crying not knowing what to do next when a beautiful soul slipped her ring off her finger and placed it on mine. I knew how I could help Maryanne, I also knew why I had been called to wear a ring that I hadn’t needed for a very long time. I slipped the ring off my finger and walked over to Maryanne and placed the ring on her finger and told her that the ring had helped me when I was in a similar space and now I wanted her to have the ring to help her to stay present and remember what she knew. I turned around to my dear friend who had given me the ring in the beginning and told her that I didn’t need it anymore and she said, “it has served its purpose for you”, and I simply smiled and nodded. Maryanne’s first words were – it doesn’t fit, it is too big! I said yes I know and you will grow into it until a time comes when you don’t need it anymore either. So just like the movie called the Story of the Travelling Pants, this is the story of the travelling ring. I hope that when Maryanne no longer needs the ring that she finds someone to pass it onto. 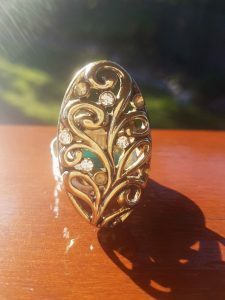 I know that I have grown so much emotionally and spiritually since I was first handed the ring and I am forever grateful that someone cared enough to give me a piece of costume jewellery that changed my life.